The EU’s new Europa building is the most important new centre of political power built this century, and a marked departure from the modernist Brussels blocks that have housed Eurocrats so far. 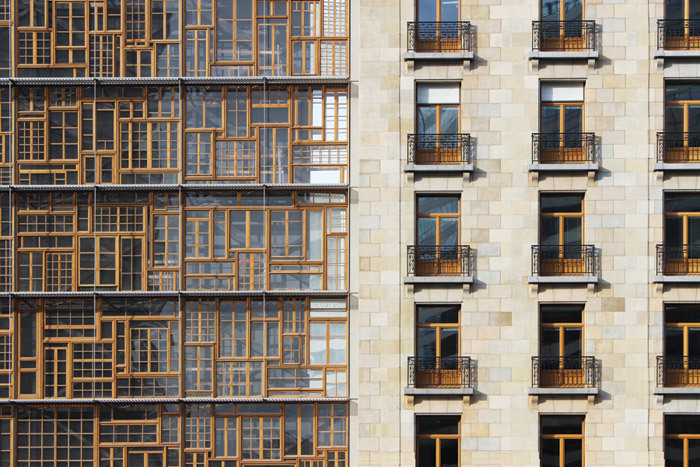 Designed to be a symbolic landmark, it not only integrates past elements in unexpected ways and visibly conveys sustainability, but also presents a poetic form behind an extraordinary screen facade. Its architect Philippe Samyn has sought to make it joyful. All images and drawings - Philippe Samyn and Partners Architects & Engineers, Lead and Design Partner. With Studio Valle Progettazioni Architects, Buro Happold Limited Engineers. Europa is a moon of Jupiter that may just harbour life below its icy, cracked surface. It’s also the name of an exceptional new Brussels building, which at first glance seems to hold an icy moon, captured and put on display in a vast, finely crafted box. There is certainly life in this one, as it glows gently in its cage. The building is the new headquarters of the Council of Europe, built for those hammering out EU legislation and to host summits of EU leaders. Its designer, the leading Belgian architect and engineer Philippe Samyn declares that ‘it’s a joyful building for ordinary people’. That may sound surprising given the vast power and prestige housed within it, but Europa exceeds ordinary expectations. The Europa building is at the heart of the European Quarter of Brussels, between the city centre and the Parc du Cinquantenaire. Long a residential district, in 1927 it stepped upmarket with the opening of a three-block, art-deco complex, the Résidence Palace designed by Swiss architect Michel Polak — swank apartments rising up to 12 storeys over the older terraced housing. They would later host offices of the Nazi’s Wehrmacht, then the RAF, and later, state bureaucrats. In 1968, an aluminium facade and extended floors were added to the block beside Rue de la Loi, and a metro tunnel driven under it. Meanwhile over the street, the Belgian government built the Berlaymont for the European Commission. 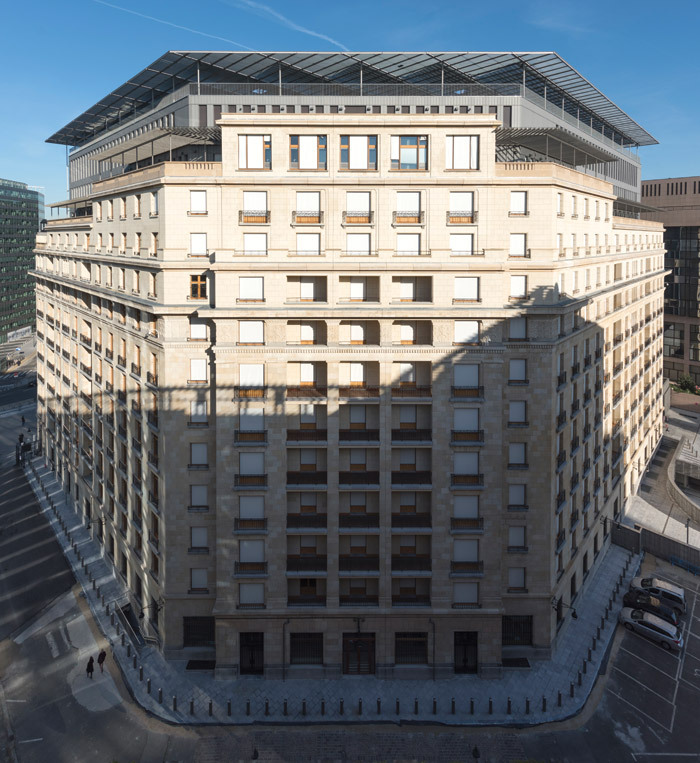 Inspired by the Y-shaped UNESCO HQ in Paris, this vast, 13-storey, X-shaped block designed by Lucien De Vestel has facades that bend into adjacent wings, and (at least until now) it is the only widely recognised EU building. It extends to a roundabout, with an underpass channelling fast traffic up into Rue de la Loi. Facing it and the Berlaymont, some of the Résidence Palace was demolished to make way for the chunky Justus Lipsius building, opened in 1995 as the new headquarters of the Council of the EU. Just down the street, a 15-storey curved glass office block called Lex by Jaspers-Eyers Architects opened as EU offices in 2006. The Europa site was occupied by one of two surviving Résidence Palace blocks, between the Justus Lipsius and Lex buildings on Rue de la Loi. Europa’s urban context, then, is the anonymous modernity of EU buildings and an urban highway. Philippe Samyn comments that ‘those official buildings have not the slightest respect for those leaders as human beings’. He’s a strong believer in responding to the genius loci (spirit of the place), but he says that here, ‘they decided to build in one of the worst places… in this neighbourhood, developers are trying to build the maximum square metres with(in) a fancy facial’. 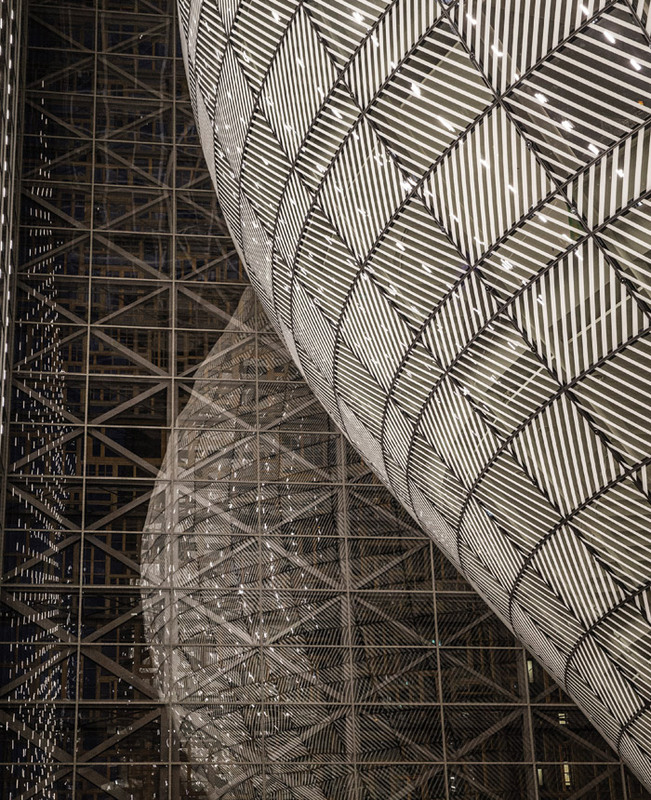 Samyn’s engagement began when an Italian practice, Studio Valle Progettazioni, assembled his practice and structural engineers Buro Happold to enter the architectural competition for a new EU Council HQ. It had to be sustainable, have high symbolic value, and incorporate listed elements of Polak’s 1920s structure. Samyn led the design and their entry won in 2005. Belgium and the EU gave the green light in 2008, and demolition began. With foundations laid, construction began in 2011. 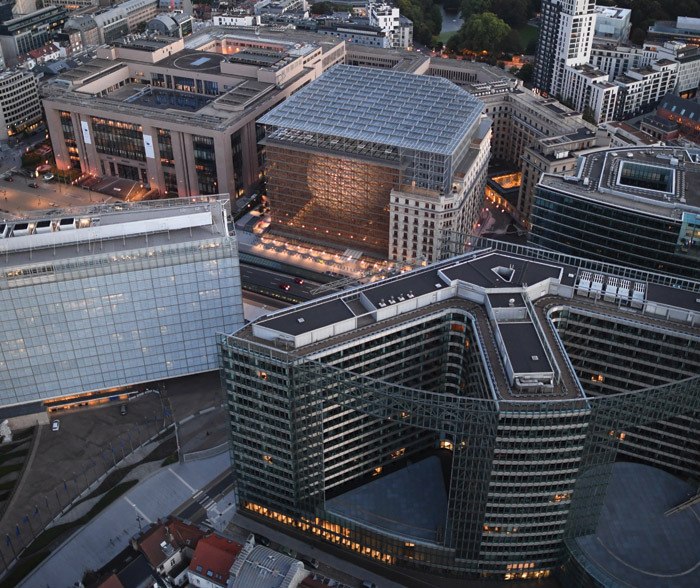 It takes over the conference and summit functions of the Justus Lipsius building, to which it is connected by footbridges on the seventh and second floors, and houses member-state delegations and the EU Council President, Donald Tusk. The Europa building’s €240m budget was set in 2004, now equivalent to €320m, and when the final bill is determined, over-runs should be small. The 12-year project became fully operational this January. Samyn credits Buro Happold managing director Neil Squibbs for giving him ‘the psychological courage to go to the end’. The 71,000 sq m building is crammed with fiendishly clever ideas, but the big idea for its form came to Samyn when he was in bed. He had a vision of a lamp. To house it, he says, he thought ‘let’s make a cube, and make a void like (eighteenth century architect Étienne-Louis) Boullée’. It’s in this void, or atrium, that the ‘lantern’ resides. This curving inner volume is a vertical tube, but because most of its surface is in its bulging middle, it seems more spherical when seen from outside the box and has been described as an ‘egg’. It is seen through one of the most extraordinary facades of the twenty-first century. Two whole sides of the cube envelope and the diagonal corner between them are defined by the solid L of the Résidence Palace facades. But the remaining two sides have another L of 11-storey screens that are a patchwork of recycled wooden window frames. 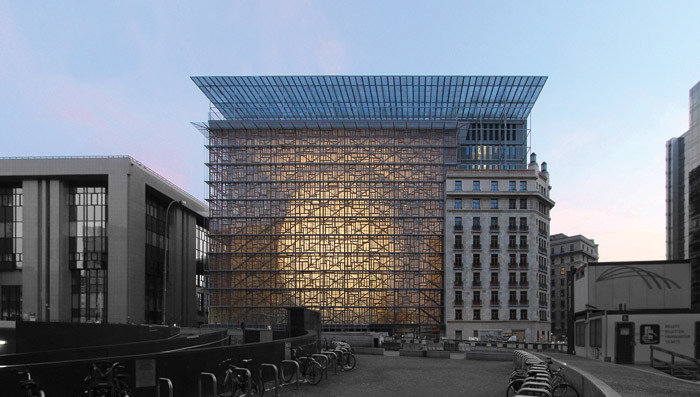 Along Rue de la Loi, the screen is indented by a small but significant part of the Résidence Palace, and the other faces the Justus Lipsius building. 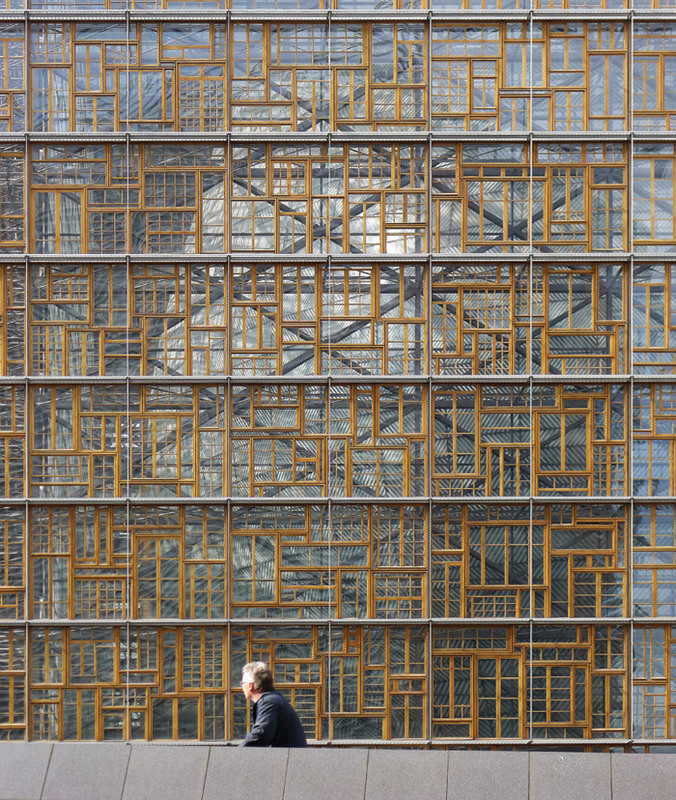 These screens contain 3,011 salvaged windows from all over Europe. 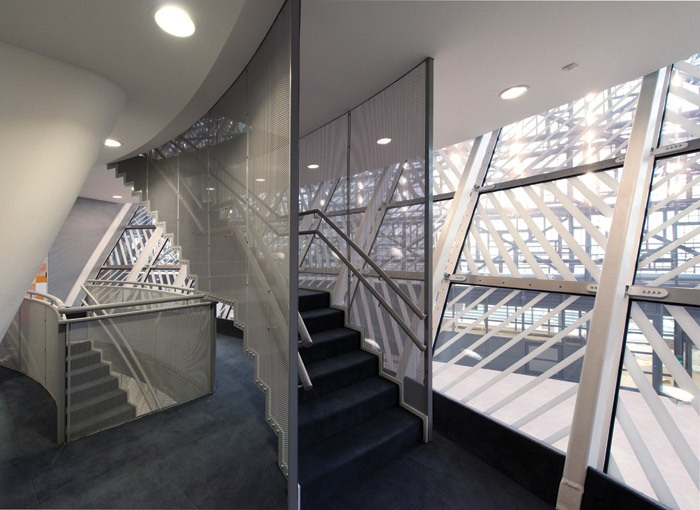 They were reglazed with low-iron glass for maximum light transmission, and attached to a lacework across steel-frame panels, each 3.54m high (the same height as the 1920s floors) and 5.40m wide. These are divided by 2, 3 , 5 or 7 (prime numbers) to define the postions of the wooden frames. There are the equivalent of 205.5 panels (there are a number of half panels), covering 3,928 sq m. The effect is delicate and intricate, like tartan sections across a vast but transparent Piet Mondrian canvas. Samyn describes it as ‘a layout with a random appearance, but tempered by measures, by perceptible rhythms’. The organic texture brings a strong contrast to Europa’s steel and glass. It speaks of the original artisanship of the windowmakers, and it also spells out a big sustainable message about reusing resources. On two sides, the Europa atrium is double-skinned. Exactly 2.7m within the wooden window patchwork, glass is mounted on a steel frame on the 3.54m x 5.40m grid, in which the X-bracing elements have varying widths, minimised according to each one’s structural stress demands, and so saving half the steel a conventional design would have used. The steel is a dust grey — unlike most greys, it’s completely colour-neutral. Vertical white-light LED tubes shine into the atrium. 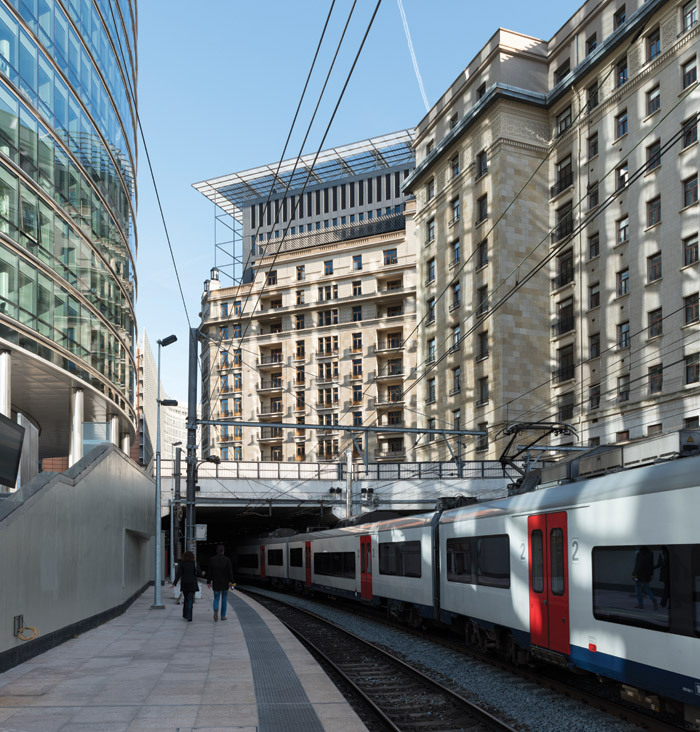 Along the Rue de la Loi side, a metro line slices across the site, so the whole 48.6m-high facade structure is actually suspended on a steel bridge at level 1, between recessed columns either side. The columns even carry the loads of the suspended ground floor. Car parking is underground, accessed by a spiral ramp. The lantern rises from the oak-laid ground floor. From there, this internal form feels like a huge balloon. It is elliptical in section, and bulges outwards from the ground, but like an onion dome, it then tapers upwards. 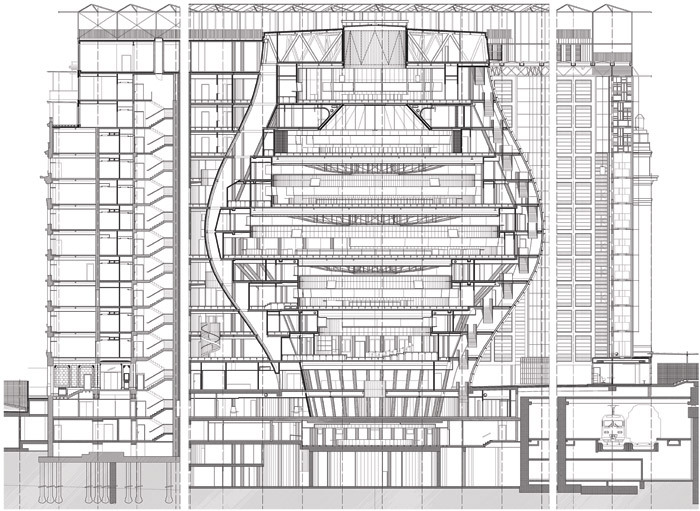 Its position is off-centre in the atrium, to anchor its spaceframe away from the metro line, and to connect with the offices in the solid parts of the cube box. If you could get up high into the street facade, the lantern would seem to lean into the louvred, wooden grid of the internal office facades, like a big-bellied bear scratching its back on a tree. At mid-height, it connects to those offices. And beneath the roof, concentric cleaning equipment rails arc around the lantern’s top, as if it were making ripples.